Rather than using weight, we use body mass index (BMI) as a criteria for surgery (excess fat in relation to height.) Generally, individuals are candidates for surgery if they have a BMI of at least 30 for self pay and a 35 BMI with a specific co-morbidity for Medicare Insurance. Because every surgeon has specific BMI requirements based on different procedures (or if you are using Medicare insurance) it is really best to speak to a Patient Counselor about your personal situation. A patient's medical history, age, lifestyle and weight history are just some of the factors that are used to determine which surgery is the best option. Our Patient Counselors have the knowledge & expertise to educate you on the different options available and assist you in your making your choice. How do I know I can have surgery because I have other health conditions? 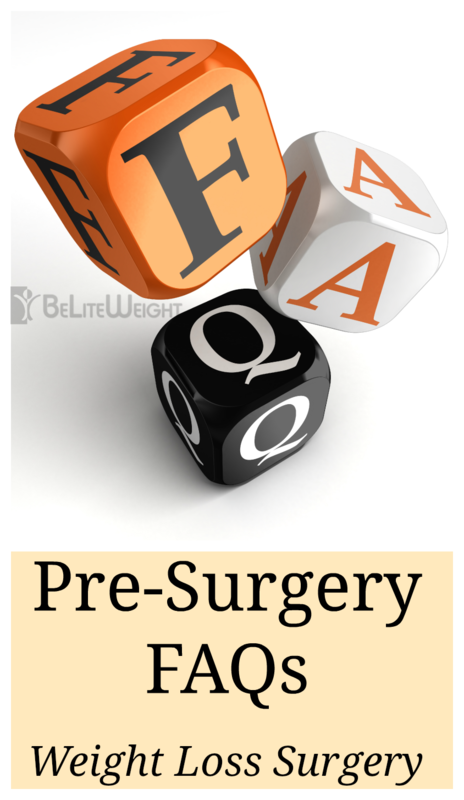 You will be asked to fill out an extensive Medical Questionnaire that is reviewed by your surgeon or his medical team. You may be asked to provide additional medical information if there is any reason for concern. Do I need to be on a liquid or special diet before surgery? All of our surgeons require a pre-op diet for one to three weeks, depending on your BMI & the surgeon. The diets are specific to YOUR surgeon. Your Patient Counselor will provide you with the specific diet your surgeon wants you to follow. What else do I need to do to get ready for my Weight Loss Surgery? You will also want to come to a complete understanding of the significant, lifelong, lifestyle changes you must commit to, including diet, exercise, limiting alcoholic intake and smoking cessation, if necessary. Can I talk to other people who have had the same bariatric procedure that I want about their experience? Absolutely, we have an extensive list of patients who are willing to share their experience with you. Just ask your Patient Counselor. Please call us today or fill out our inquiry form to be matched with a personal Patient Counselor who will guide you thru the rest of the process.